We’re back! We always make a point of going to a new island each visit. It keeps a sense of exotic adventure and discovery alive even though we have now been to 8 resort islands. We’ve just arrived for what promises to be adventure on steroids. 8 islands in 7 days. Now that the kids have grown up, we have more mobility. Most importantly, it provides a huge opportunity to scour new treasures and gems for MaldivesComplete. 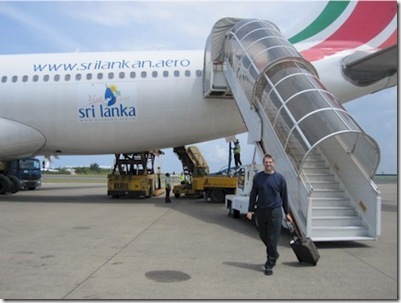 The adventure started with our flights today on Sri Lankan Airlines (flight UL 502). As noted in our trip last year, we have always bought ‘package’ with the flight included. But last year’s ‘DIY’ trip planning worked really well. So well that you would wonder why we flew Sri Lankan Airlines instead of BA. BA did a great job last year and I have my frequent flyer miles with them, so why the switch? Convenience – My wife Lori had fixed dates that she could accompany me that could not move. Sri Lankan had more choices of direct flights and two of those flights fit our needed perfectly. In fact, schedule constraints is the primary reason to book yourself rather than opting for a tour package since the packages typically have very fixed dates. Cost – Sri Lankan Airlines was about £100 cheaper than BA and about £200 cheaper than Emirates (the other direct carrier who also happened to have fewer flight options). Curiosity – I have been flying the UK national carrier for the past two decades since we arrived in the UK and I was curious about the service and approach that the local national carrier performed and approached the route. The flight was fine. Pretty conventional amenities. The in-seat entertainment system was modest, but at least there was one. The service was especially cheerful and the colourful uniforms of the flight attendants helped set the tone for a trip to paradise. Halloween Treat – On a 10 hour long haul flight, the first concern is seat comfort. I immediately noticed that touch extra leg room (32” versus BA’s 31”) as well as the surprisingly helpful extra seat width. Then I also quickly noticed the ‘SICMA seats and lumbar-support’ tucking into the small of my back. Along with a neck pillow, this support made it the easiest flight to sleep in the sitting position that I have ever experienced. Halloween Trick – I had bought the ticket on the Internet and like many places was supposed to present the card that I bought the ticket with to the check-in desk. The only thing is that last week we lost one of our Mastcard cards and had to have it replaced (and new number issued). As a result, when I showed up with the replacement card to the check-in, Sir Lankan Airlines made me reissue the ticket on the card at an extra cost of £30. Lesson – If you have to have a new card, still keep the old card if you need to present it in order to check-in to an online purchased flight. 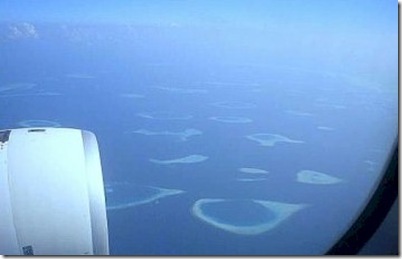 Tip – Get left side of plane window seat (not over wing) going to Maldives and right side departing. This way you are positioned best for one of the most spectacular aerial views as you first hit the archipelago (see below). Concernant des aspects tout à fait français des Maldives, si vous préférez la vie gaulloise, il vous faut cherchez Rihiveli Beach. The staff and the largest part of the guests are French. This cultural colour spills into many aspects of the resort such a visiting French DJs, newsletter and obviously ‘la cuisine’. If you want a soupcon of French style with your paradis. Speaking of French beauty and fashion lately, if you are looking for a different sort of ‘natural beauty’ or ‘stunning scenery’, then Coco Palm Bodu Hithi and Coco Palm Dhuni Kolhu is the place to go from 11-18th November when they are hosting the Miss France 2011 contestants for a range of activities and photo shoots. PS. I think it is intriguing that the Soneva resorts (Fushi and Gili) and the Coco Palm resorts (Bodu Hithi and Dhuni Kolhu) seem to be vying for the title of most cool events (check out the ‘Events’ section of the ‘Best Of’ page). One more reason to pack next to nothing on your trip to the Maldives. When I arrive at the Maldives, I take my shoes off in my room at the resort, set them aside…and don’t touch them again until it’s time to catch our departure transfer. I love spending the entire week shoeless. 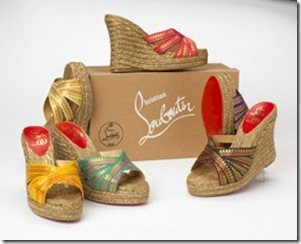 For some bizarre reason, on the last several trips I brought sandals thinking that I might slip those on, but they languished at the bottom of the suitcase untouched. 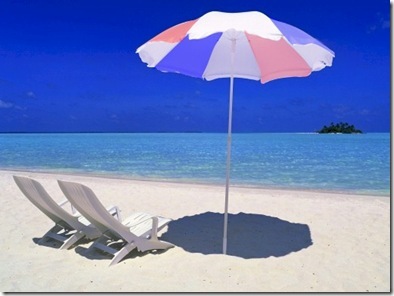 I particularly love the resorts that have lots of lounges and restaurants set on sand instead of concreted over floors. That said, sometimes some resorts will have places where they have a shoes required dress code (typically for safety reasons around dining and drinking areas in case a glass gets broken). In honour of Soneva Fushi’s hosted Eco Conference taking place this week (if you go to their micro-site, you can find a number of press releases about some of the content), I thought that I would call out yet another distinctive for Soneva on the same eco theme. 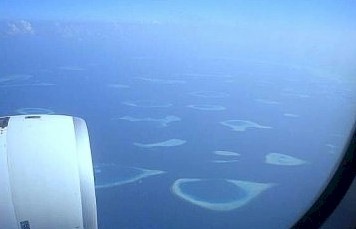 Maldives have long been the poster child for environmental awareness and initiatives. 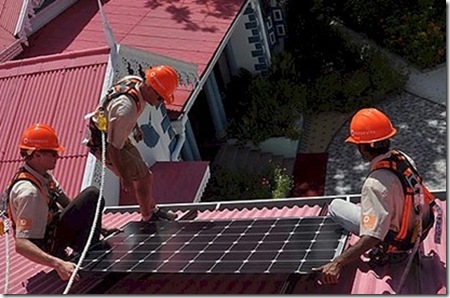 The latest tactic in battling global warming that has gotten a big profile is solar with the President of the Maldives Mohamed Nasheed donned hard hat and tools and personally helped installed solar panels for his official residence. 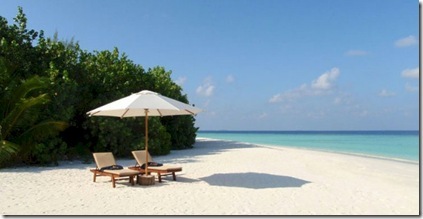 On the other end of the spectrum from child-free Dhoni Island is child-embracing Diva resort. While places like Sheraton Full Moon have a great kids club, or a special feature like Conrad Rangali’s ‘Kid’s Spa’, I have not come across any resort that has thought through the ‘Family Experience’ from welcome to nite-nite time the way that Diva has. As I have mentioned before, my original inspiration for Maldives Complete was going to be a web site called ‘Maldives for Families’. So Diva’s inspired touches warmed my heart. The Diva enhancements are not just special touches catering for the younger crowd, but actually well-thought out touches just as welcome to Mom and Dad…interconnecting rooms extra nappies, bottle sterilizers. Using the new ‘Children Welcome’ filter to the ‘Resort Finder’ page allows people to dial up their child friendliness from ‘kids play free’ right down to ‘kid free’. 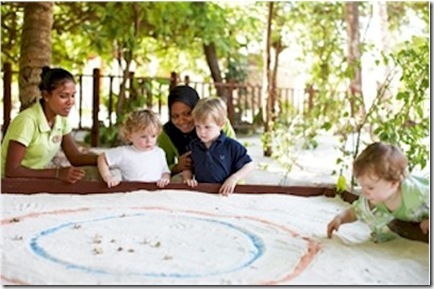 As it turns out, the Maldives resorts vary in their embrace of children as widely as public sentiment. Some have invested in elaborate ‘kids clubs’ like Sheraton Full Moon and Conrad Maldives Rangali, both of which I have post on. Others like Baros, Meeru, Komandoo and W Retreat also have restrictions. But the most restrictive child policy is Dhoni Island which does not allow anyone under 16. So if you are one of those put off by peals of laughter and splashing about, then Dhoni Island is the best of the Maldives for you.